Since Wegman’s came to our town, I have been loading up on Rhubarb every time I go. By far it is the best price I have seen and while strawberries are still reasonably priced I will be making Strawberry Rhubarb dessert recipes for the family. 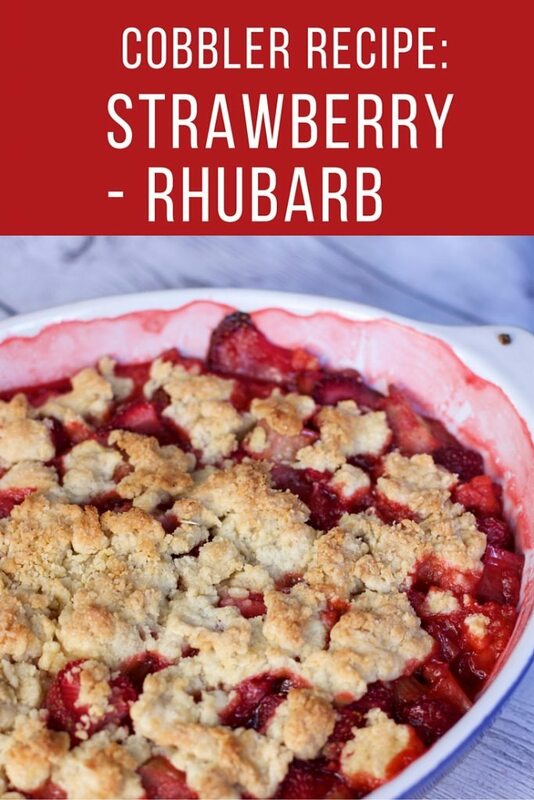 Typically I make a Strawberry Rhubarb Crisp Recipe but found a Strawberry Rhubarb Cobbler Recipe recently that I wanted to compare. 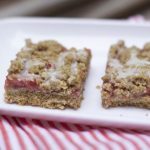 If you prefer to serve bars at a party don’t miss our strawberry Rhubarb Crunch Bars a big hit with family and friends. 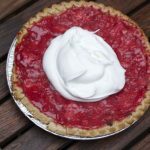 Don’t let the summer go by without trying one Strawberry Rhubarb Dessert recipe, you won’t regret it and I am sure you will be as obsessed as I am. 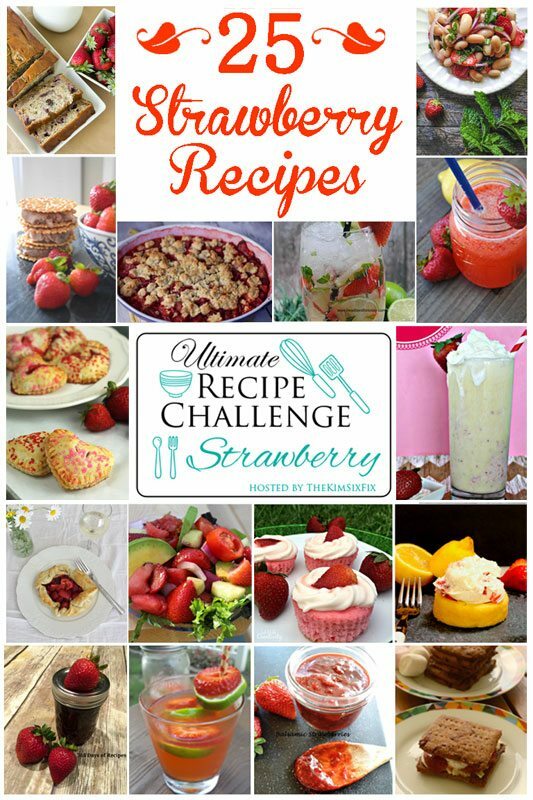 Don’t forget to go all the way to the bottom of this post as we are sharing 25 other amazing strawberry recipes from this month’s Ultimate Recipe Challenge. That means a bonus 24 strawberry recipes that will have you buying up the strawberries at your market. Crisp and Cobbler recipes are so flexible as long as you have the topping recipe and right amount of fruit. Feel free to mix up the fruit combinations for whatever is in season or you have in the freezer. These recipes do great with both frozen or fresh fruit so you can enjoy the fruits of summer all year round. 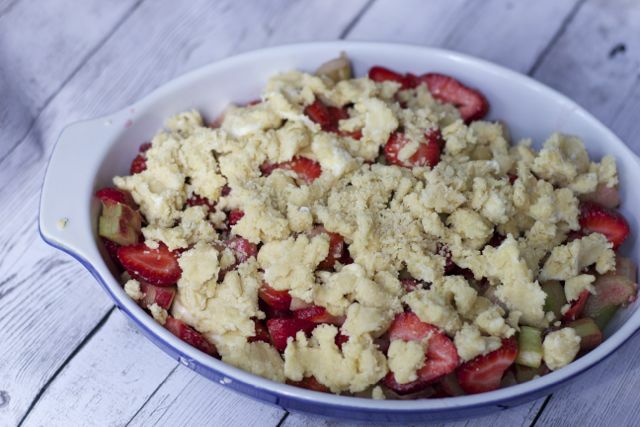 Layer the fruit and other ingredients into a baking dish. 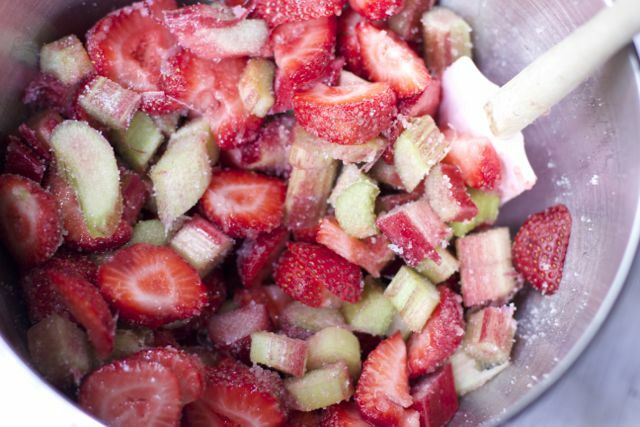 Make your cobbler recipe topping and sprinkle over the chopped strawberry rhubarb combination. Bake for 40-45 minutes until bubbly and golden brown. Any cobbler recipe is best served warm, so be sure and consider the timing and when you want dessert. This time ours sat about 45 minutes before we ate and it was still delicious luke warm. Be sure and use the extra syrup and drizzle it on top of your ice cream. 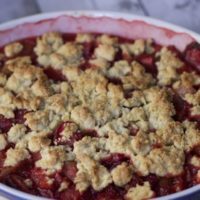 Homemade Strawberry Rhubarb Cobbler recipe is the best summer fruit dessert recipe you will ever need. 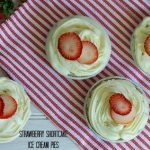 Now for all the other 25 amazing strawberry recipes I promised you. 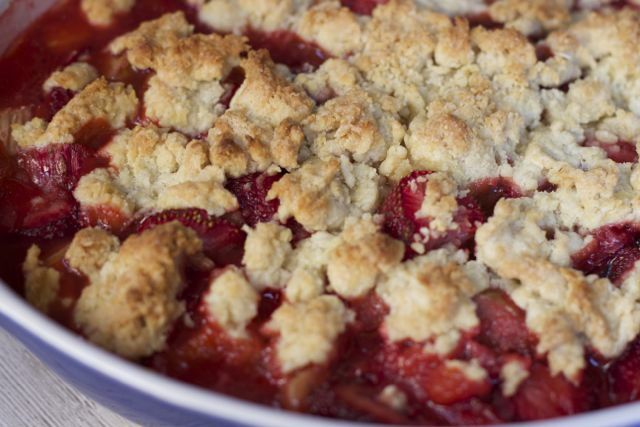 What is your favorite summer cobbler fruit combination? Which recipe from above do you want to try first?? It looks so delicious and the perfect dessert for summer. I love all things strawberry. This looks delicious! I love rhubarb – it reminds me of being a kid. My neighbor growing up made the BEST rhubarb pie. I can’t wait to try this! 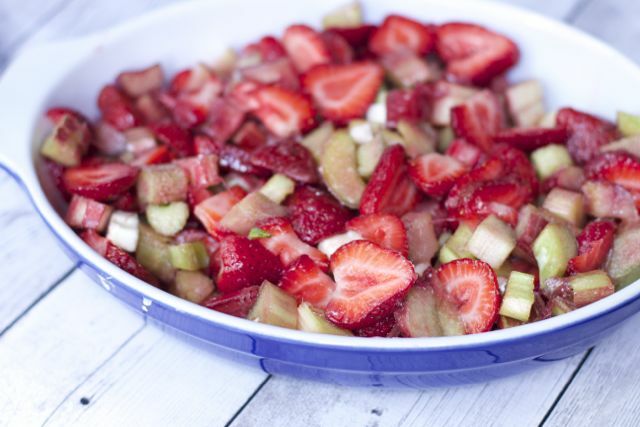 Love the classic combo of strawberry and rhubarb. Cobblers are so easy to put together, making it the perfect weeknight dessert. Also great for weekend brunches too. so true and no need for the extra crust either. That looks amazing! I’ve never cooked or baked with rhubarb before but I know I have family that likes it so I’ll have to try it for our next family get together. Thanks for sharing! 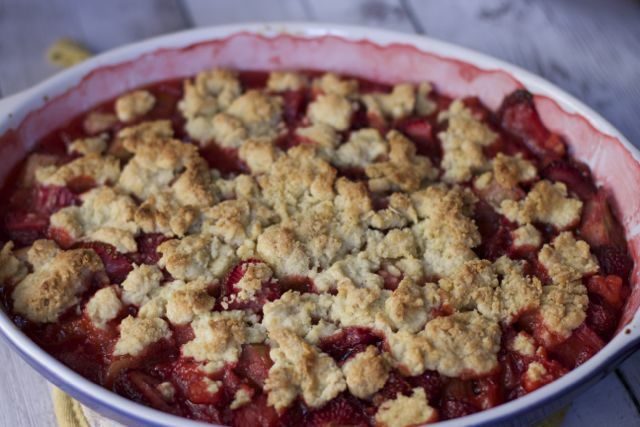 This looks really good and I’m glad you made it a cobbler because it’s much easier than a pie and since my daughter likes strawberry rhubarb pie I can use this recipe instead of making pie and I think she will love it. Ooh, that looks so delicious, my mouth is already watering! That’s such a great summer combination!